I hope that you had a wonderful Mother’s Day. Mine was low key and just how I like it. I stayed in my pj’s and cooked all day. The kids sat at the kitchen table and hung out with me and played Legos as I worked. AND everyone got along. No fighting over whose turn it was for anything. It was a Mother’s Day miracle! 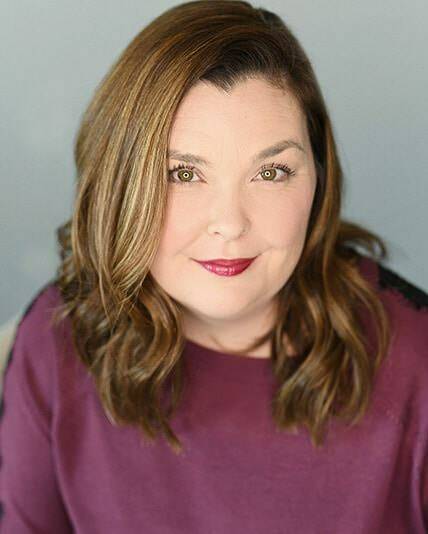 I shared a post on my thoughts on what it takes to be a “good mom” over at breehester.com. I’d love it if you would stop by and say hello. We eat a ton of chicken at my house. It is one of the few things that everyone eats. It is also one of the things that I always buy organic. It is important to me that we eat organic chicken, but can be really expensive. I have found the best way to get the most bang from my buck is to cook it in the slow cooker and shred it. I buy a few packages of chicken, season it well, and let it cook on LOW until it is falling apart. I take it out and shred it, and it is perfect. Obviously, you do not need to use organic chicken for this to work, I’m not debating organic/non-organic, just telling you why I started doing this. I use it in soups, enchiladas, pasta, sandwiches, salads, everything. I make a lot, and freeze it in bags and can just pull it out of the freezer when I need a quick dinner. I made Sweet and Smoky Barbecue Sauce for Dixie Crystals and I love it. It takes 15-20 minutes to make and is so good. I was going to make chicken sandwiches, but I saw the chips in the cabinet and knew that nachos needed to be made instead. I made a version similar to my favorite BBQ chicken pizza and these were amazing. I had not made nachos in ages, and these were a welcome surprise. 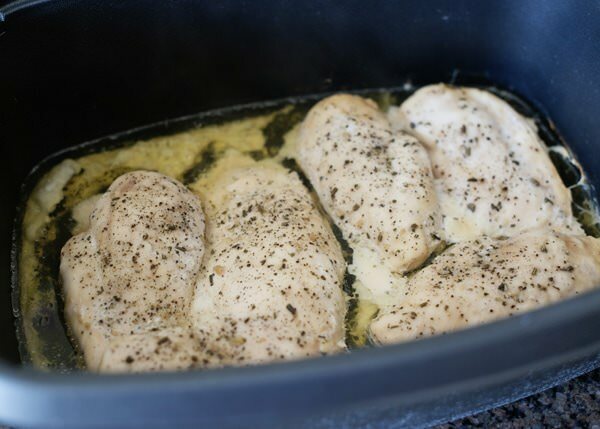 Season chicken generously, on both sides, and place in the slow cooker insert. Cover, and cook on LOW for 4 hours. After 4 hours, the chicken will be cooked through and tender. There will also be some juice and fat. I pout it out. I use tongs to take the breasts out and put them in a bowl. Use the tongs to shred the chicken. It should come apart with little effort. 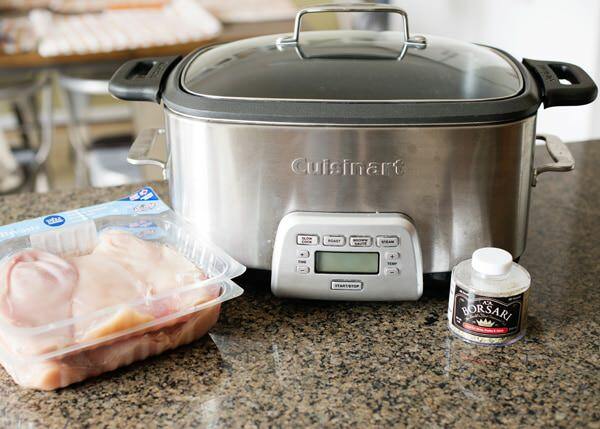 You can also use a stand mixer, use the paddle and 30 seconds later, you have shredded chicken. I add the chicken to freezer bags, and label with the date, and I have chicken ready for soup, tacos, pasta, anything you like. 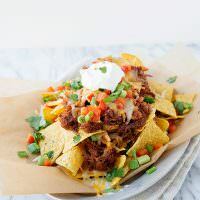 To make the nachos, I toss about 1 to 2 cups of shredded chicken with barbecue sauce. Add a layer of chips and top with half of the chicken. Add cheese, peppers, green onions, and cilantro. Add another layer of chips and repeat. Place under the broiler until the cheese is melted. Top with sour cream. 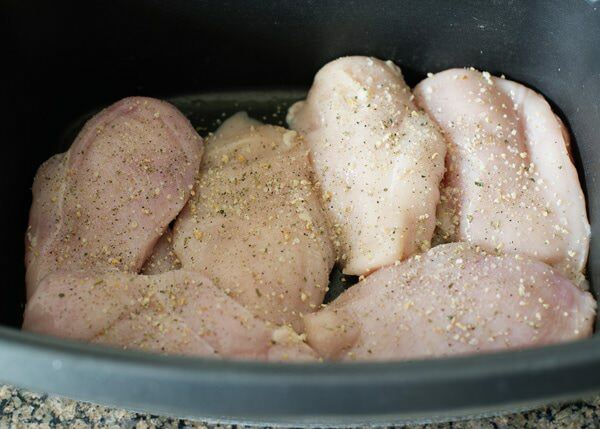 Season chicken generously, on both sides, and place in the slow cooker insert. Cover, and cook on LOW for 4 hours. After 4 hours, the chicken will be cooked through and tender. There will also be some juice and fat. I use tongs to take the breasts out and put them in a bowl. Use the tongs to shred the chicken. It should come apart with little effort. 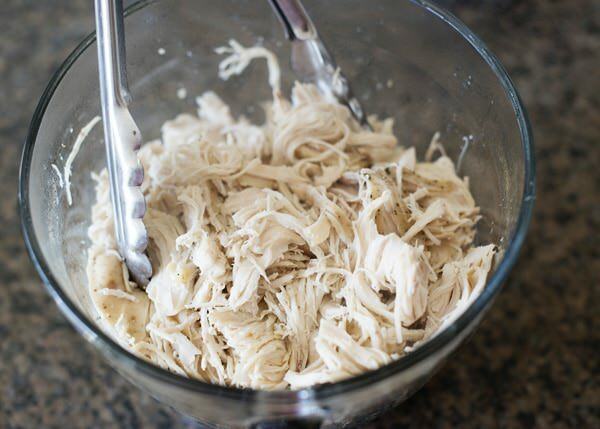 You can also use a stand mixer, use the paddle and 30 seconds later, you have shredded chicken. I add the chicken to freezer bags, and label with the date. 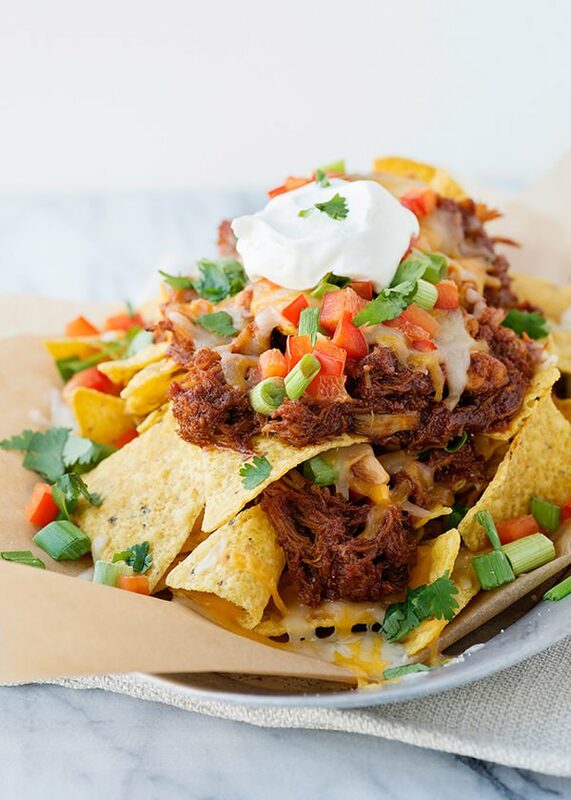 I’m such a sucker for a plate of nachos. Give me a cold beer and I’m a happy mama! 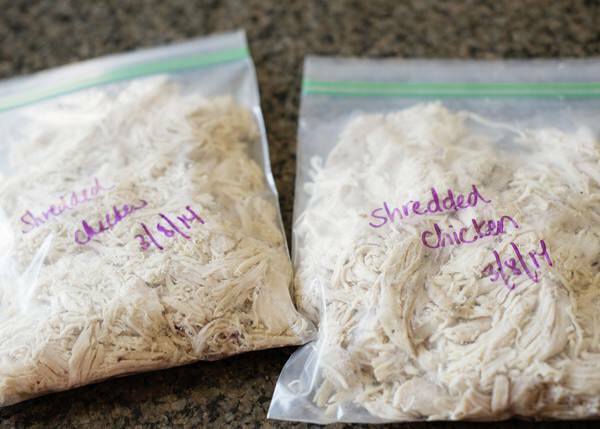 I make shredded chicken in the slow cooker too- such a lifesaver on busy nights when I need a quick dinner! Come over and we can drink beer and eat nachos together! That sounds like the best night ever. That looks amazing!!! Do you mind me asking where you purchase your organic chicken? We live in a small town and they don’t sell it here. I didn’t know if a Costco might have them. Thanks! Thank you! I buy Bell and Evans brand at Whole Foods. But, we have also lived in very small towns. I usually could find it at my regular grocery store and if not, the butcher would order it for me. You can buy it online and I know that Costco carries it. Thank you! Me too. 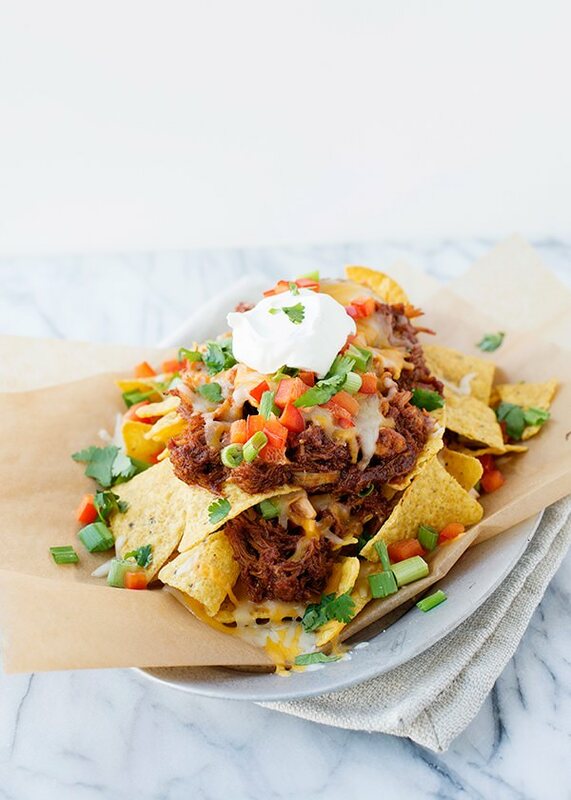 Nachos are my favorite. I never think to make them at home. Somehow I’ve never been interested in a slow cooker. That is, until I saw this post. How delicious and comforting does this dish look! 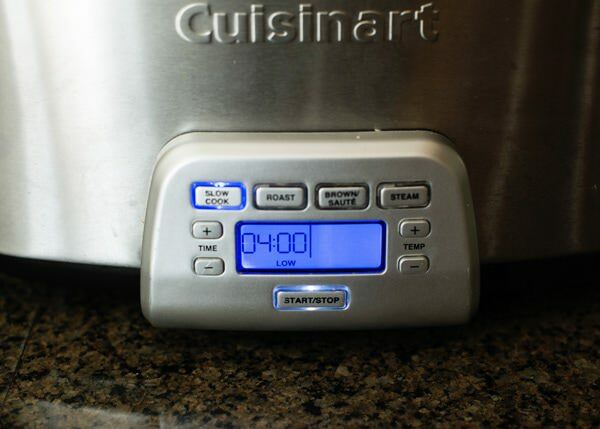 Bookmarking this and definitely thinking about buying a slow cooker myself. OH my I could so stress eat these right now. They look fantastic. 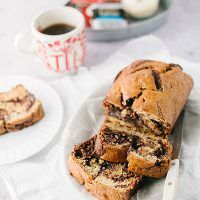 Just found this delicious recipe! 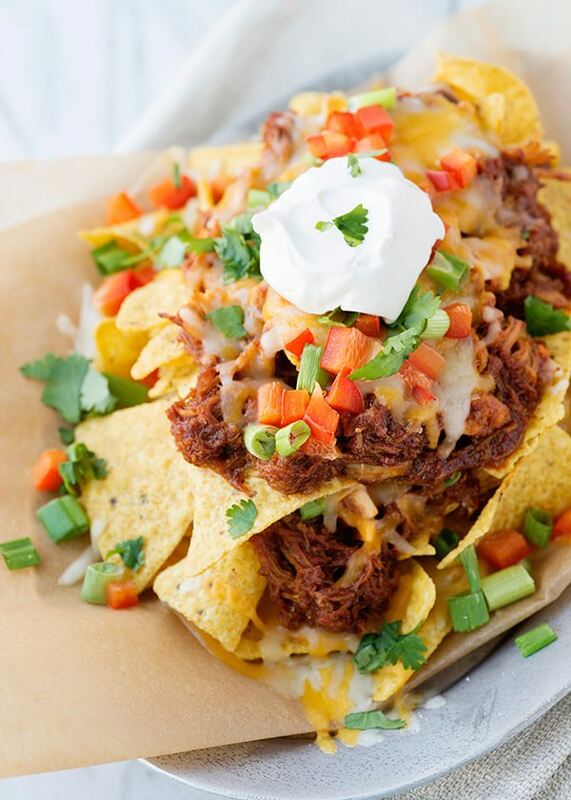 How many people would you say one batch of the nachos can serve (as an appy)?